Wonderful Japanese Yukata Kimono with silk Obi. Comes with Tatami Mat shoes and Tabi Socks (We only have size 8.5-11 in women's shoes and socks in stock. Kimono is 100% Japanese Cotton- wears and washes very well- comes with same fabric sash- so you can wear it around the house when you are finished with Halloween!) 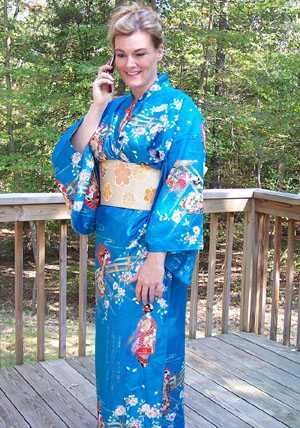 Also this Kimono comes only in 1 size- which fits all up to a US women's size 18.